There’s a line in a book, I don’t recall which, where the main character uses the phrase “my traitorous lungs.” I kept thinking of that, running the line through my mind over and over again, as I felt the lump under my arm. It was right on a lymph node, I suspected, having seen how far they stretch, how vast they run. And despite being scared, I just kept repeating the word over and over again – my traitorous body, my traitorous skin, my traitorous muscle – until it made just as little sense as the situation did. You hear about these situations and assume they’ll never happen to you. I’m 28. I’m relatively healthy. I shouldn’t find lumps the size of the tip of my pinkie finger hiding out under my skin, polluting everything around it. I shouldn’t – and yet I did. So I called my doctor, scheduled an appointment for later that day, and logically planned my attack. Also, I cried. Samir was out of town, and really I didn’t want to tell anyone about my will hopefully be nothing situation, so I took myself to the doctor after leaving work early. He felt the lump, confirmed my suspicion. It is, in fact, there. It is, in fact, a random mass. It definitely should be looked at. So that’s when I started to make the calls. Having just gone through this with my mom – a year of breast cancer treatment which, thankfully, is finally over – I was well accustomed to hearing the stats, scheduling the appointments, and, really, just playing it cool. That’s who I was during her time. I was the observer who jotted notes down to research later. Who asked the questions that needed to be asked. Who kept everyone calm. I resumed that role again as I scheduled my mammogram, as I told my mom, as I researched my situation. I played it cool because it was the only thing I knew how to do. I hated referring to it as a mass, as a lump, as an anything thing that shouldn’t be in my body. So I named it Fred. Fred sounded less frightening. Fred wouldn’t hurt me. Two days later, yesterday, I had my first mammogram. Most women start later, at 35 or 40. I started at 28. I sat in a room wearing a blue cloth gown tied tightly around myself as I noticed each woman walk in. Each woman was almost double my age. They all gave me the same “oh, poor you” face that I hated. I didn’t want sympathy. I wanted to leave. My mammogram went smoothly, if not uncomfortably, and then the ultrasound was cold and wet and weird. I figured my first time having one would be when I was pregnant. I assumed wrong. I took a picture to text Samir, who was waiting for me patiently in the other room. The black jellybean is Fred, my mass. I waited, waited, waited for the results. It’s cliche, but it did feel like it took a full day. A week. A month. But the doctor came in and showed me the films, showed me the pictures. And I was right about so many things. Fred was on my lymph node. Fred was quite large, 5 mm. It was smart to get Fred looked at. But despite all that? Fred was nothing. Fred was, in fact, simply an enlarged lymph node. And I was completely fine. I think I asked her if I was okay at least seven times. Perhaps eight. I think it took me at least seven minutes to process the information. Perhaps eight. Of course everything was great after that. I called my parents, my friends who sent me encouraging texts throughout the day. It was over, and I was fine. But here’s the thing – while everything was fine, and Fred was just something I’ll live with, I’m really glad I still got him checked out. Because he could have been worse, he could have been horrible. There’s a part in The Art of Racing where the wife refuses to go to the doctor because she knows there will be bad news. I didn’t understand that when I read it – why refuse to know? 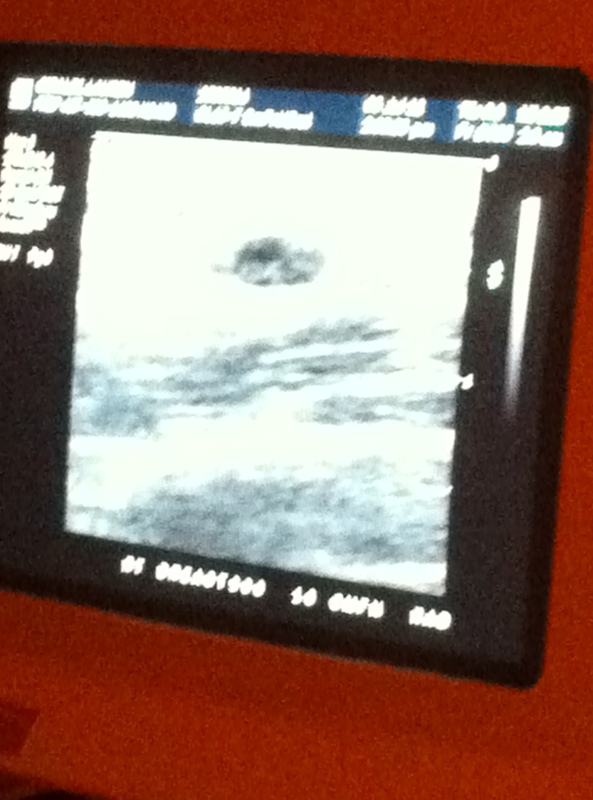 But sitting under the ultrasound, I understood. Sometimes not knowing is easier. Especially when you know it will be bad. …and, yeah, so am I.
I am soooo glad you are ok! The beginning of the story had me really worried! I was thinking “she is too young to have ‘Fred’!” I didn’t know about your mom BUT am very glad she is ok! Glad everything turned out okay! When the inevitable zombie apocalypse starts, remind me to look you up. You are one tough cookie, Lauren. I’m with you, if I find something out of the ordinary I want to know what it is. Give it to me straight. I lost two grandparents to cancer. I’ve seen firsthand what the treatments do to the people you love. The lump was there either way. Better to know what it was than constantly worry. At the end of the day, you have to do what you feel is best for you. I would have had it checked out too. You can never be too young for cancer, or something like Fred. I’m glad you are okay. So glad you’re okay! I went through a similar thing when I was 19 (minus the mammogram, just the ultrasound) and it is so insanely scary. It really is better to get things checked out than to just assume or hope you’re fine and worry about it later. In this case, ALWAYS better to be safe than sorry! I’m sorry this isn’t so timely and I’m commenting a couple weeks late. Just wanted to say I’m so happy that you’re okay, and wow… what a scary experience that must have been. Thank you for sharing that here. Again, so happy things are all good for you, and for your mom too. Oh gosh. I’m just glad you’re okay. And I hope Fred never becomes Freddy Krueger. I’m so glad you had people around you though to be with you and that you’re okay. I’m glad you’re ok. Sorry it took me so long to get to this post. I am so very behind.